The Clarion Hotel & Conference Center Modesto features 186 newly renovated rooms and more than 10,000 sq feet of flexible meeting and banquet space. The Clarion Modesto is a unique venue featuring the Central Valley's only indoor tropical atrium complete with exotic plants and an indoor pool and jacuzzi. The Clarion Hotel & Conference Center features a ballroom, 5 separate meeting rooms and 2 board rooms as well as other more unique meeting facilities. We offer full Catering as well as an in house restaurant and lounge. Our Dedicated Sales Staff is experienced in taking care of your event from start to finish. We pride ourselves in the one on one guest service that you deserve. Cancellation 72 hours prior. All children must be registered with the front desk. This package is available for small meetings for up to 50 people. Package will include rental of meeting space for up to 5 hours (ea additional hr. add $50.00), Coffee (up to 2 gallons) and water service. Package includes rental of one Vineyard room (up to 1360 sq feet) based on final attendance count. Clarion Hotel Modesto is conveniently located right off of highway 99 at the Briggsmore / Carpenter Exit. Centrally located in Modesto with easy access to shopping and dining. Onsite parking is free and available to all attendees. Free High Speed Wireless internet is included. We have a full service all ages sports pub & grill located onsite with lunch specials available for meeting attendees. A wide array of catering is also available. 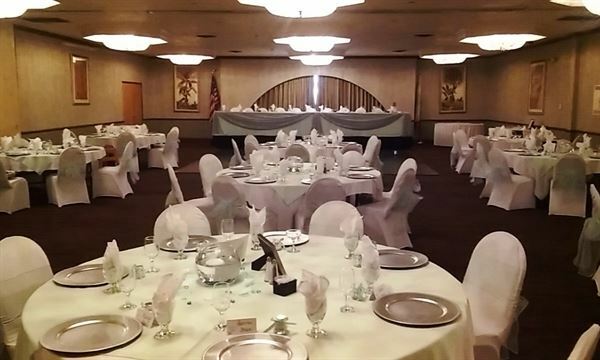 The Clarion Hotel Modesto would be proud to host your event. Our wedding packages include * Spacious Reception Ballroom (Up to 300 people) * Complimentary Champagne or Cider Toast * Complimentary Tasting of up to 2 menu options * Complimentary Cake Cutting Service * Complimentary Consultation and beginning to end advisor * Complimentary Room for Bride and Groom with Romantic Breakfast for two * Discounted Room Rates for out of town guests * Photo Op Locations onsite * Rental of all Tables, Chairs, China, Silver, Glassware * Basic White Linens ( Colored linen can be rented $10.00 per table, $.50 per napkin, $2.00 per chair cover. Our onsite professional Sales team will assist you from start to finish. We have a wide array of catering options available. We are proud to announce the availability of an onsite minister available to officiate ($150.00 charge). Package does not include food or beverage orders. I held my 70's themed birthday party at the Clarion Inn Conference Center in Modesto. The staff was great and accommodating. I did not get to eat too busy but all of my guests loved the food.